Cyanide & Happiness has a Patreon! Become an Ultra Megal Pal today! Ad rates are down, YouTube is changing, and we have to change with it in order to stay afloat. That's why we're turning to the one thing we know we can count on to support our animated shorts: YOU! 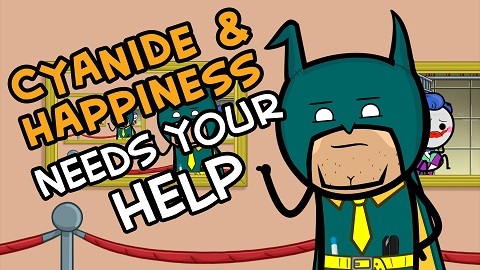 If you've enjoyed our weekly animated shorts over the last 5 years, and would like to see them continue well into the future, please become a Cyanide & Happiness Ultra Mega Pal on Patreon, and contribute a few dollars a month. For just the cost of a cup of coffee, we will be able to buy a cup of coffee, which we will share. For the cost of several thousand cups of coffee, we will be able to keep producing the high quality, super funny animated shorts that you've come to love every single week! We really don't want to scale down the quality or frequency of our animated shorts, but, as it turns out, animation is REALLY EXPENSIVE. In order to stay independent and make the kind of jokes we want to make (the kind that SOME advertisers find objectionable), we need you to help us out. Won't you please, please won't you be... won't you be our Ultra Mega Pal?